The Public Service Commission changes course and delays decision on who must pay utility costs for Milwaukee Streetcar. The streetcar near the Milwaukee Intermodal Station. Call it the mystery of the Public Service Commission. 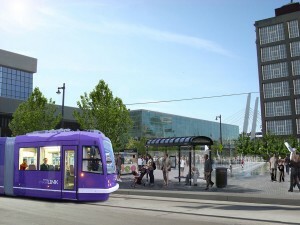 The state commission, which regulates public utilities, seemed to have a consensus with at least two of its three members arguing that Milwaukee’s streetcar project will serve the public good. This would mean utilities like We Energies and American Transmission Co. would have to pay the reasonable costs of relocating utility connections, rather than the city. But after taking a ten minute break in its meeting today, the commission’s members came back and decided they would delay any decision until the next meeting. At issue was Brett Healy‘s petition for a declaratory ruling to determine the allocation of utility relocation costs. Healy, a streetcar opponent, has argued that the utilities’ rate payers shouldn’t have to foot the bill for costs caused by the creation of a streetcar line. For members of the PSC, the question was whether the project meets the legal definition of a “police power” — meaning it serves the common good, or whether it is a “proprietary act” by the city which doesn’t serve the public welfare, in which case the utilities would not be responsible for any relocation costs. “We have two votes for a police power exercise,” stated Commissioner Eric Callisto, referring to his vote and that of Commission Chairman Phil Montgomery. Both were prepared to rule that the construction of the streetcar project was a legitimate use of the police power of the City of Milwaukee. To buttress his conclusion, Montgomery quoted from Wisconsin State Statute 85.063: “The legislature finds that development of urban rail transit systems to serve urban areas of this state will enhance the welfare of all of the citizens of this state through conservation of fuel, enhancement of the development of alternative transportation modes and improvement of air quality.” Callisto was just as emphatic: “to me, issue [police power vs proprietary] is not a close call,” he said. Callisto added that despite Healy’s claim to the contrary, many more states treat transit projects as a use of police power than as a proprietary action. A second issue for the commission to rule on, should it conclude the project was a legitimate use of police power, was if the utilities are responsible for all relocation costs for a public works project in the public-right-of-way, as municipal law specifies. “There is a limit to what I consider reasonable,” said Montgomery, adding that he felt no more than $10 million should have to be paid by the impacted utilities. Montgomery, however, offered no reason for picking that particular ceiling. Callisto pointed out that the project design is not complete (in fact, it is not projected to be 60 percent complete until 2013) and therefore he was not prepared to pick a cost ceiling for the utilities. He further argued the petitioners have the burden of prove in regards to reasonableness of the law and there was not enough evidence to rule the city is acting unreasonably, suggesting he would dismiss the petition as unproven. Commissioner Ellen Nowak made it clear she believed the city’s actions were proprietary in nature, meaning she supported the petitioner’s claim. “It is not the commission’s role to weigh in on the wisdom of the streetcar project,” she added. In short, it looked like a 2-1 vote in favor of the city. But the the commission took that short break and when it returned it decided to lay the issue over. Montgomery explained that this was simply to allow Nowak “one more kick at the cat,” but emphasized that the delay did not imply “a shift of position or anything else.” And so the commission voted unanimously to lay the issue over. -Another attempt by Ald. Donovan to force a referendum over the streetcar project failed on a 11 to 3 vote. -At a recent Transportation Review Board meeting City Engineer Jeff Polenske explained that by moving a portion of the streetcar route from Broadway to Milwaukee St., this would save 95% of AT&T’s estimated costs. What ever happened with Bauman’s move to have the utilities start paying rent on the land the utilities run through? @CJ Oh I’m not sure we can really do that, but I imagine if things don’t go the city’s weigh it might come up again. Dave (or anyone else), I’m wondering if you could provide some pros and cons of using two parallel streets for a given route, vs. one street. I’d imagine that it’s preferable to have both on the same street, but on the other hand, dividing the route onto two streets carries passengers past more businesses. Guys, we have a crisis on our hands. The public does not understand that this is a starter system and is losing their minds about the project. Someone needs to get the mayor talking about it that way or the goon squad (ie the jsonline comments section) is going to only grow stronger. I’m not sure it matters a ton in this case, but from a transit planning perspective, creating a one-way couplet decreases the area a particular transit line serves. A clear explanation of this can be found at Jarret Walker’s Human Transit blog (http://www.humantransit.org/2012/02/one-way-splits-as-symbolic-transit.html), but essentially splitting the line over two streets increases the amount of distance users have to walk to access both directions (said another way, it reduces the number of users who can easily walk to both directions of service). Again, I’m not sure it will hurt the streetcar that much, but from a moving people perspective, you would want to have both directions of service as close together as possible. Thank you for the insight, Kevin!